LAURIE, Mo. (CNS) — Marian hymns and chants resonated through the foothills of the Ozark Mountains on Mary’s newest feast day. Bishop W. Shawn McKnight offered Mass at the National Shrine of Mary, Mother of the Church, in Laurie, the Monday after Pentecost — which Pope Francis recently designated a universal feast day honoring Mary, Mother of the Church. It was the first visit to the outdoor shrine for Bishop McKnight, a Kansas native who was ordained and installed as bishop of Jefferson City in February. The shrine is on the grounds of St. Patrick Church near the Lake of the Ozarks. “Of all creatures ever created, both spiritual and material, including the highest angels — Mary alone, for all eternity, can look upon the second person of the Blessed Trinity and say with all truth, ‘You are my Son! '” Bishop McKnight noted in his homily for the May 21 Mass. As the mother of Jesus, she is the spiritual mother of his church, the body of Christ on earth. Surrounded by nature, cascading water and several hundred Catholics, Bishop McKnight said it was a good day to contemplate Mary’s unique role in God’s plan for the salvation of humanity. The celebration began with a candlelight procession from St. Patrick Church down the hill to the shrine. Joining the bishop and the faithful were Father John Schmitz, administrator of the Laurie parish; Father Robert Fields, administrator of neighboring St. Bernadette Parish in Hermitage and the Mission of Our Lady of the Snows in Climax Springs; about 20 fourth-degree Knights of Columbus; and about 40 members of the Equestrian Order of the Holy Sepulchre of Jerusalem. Bishop McKnight said Pope Francis had given the church a tremendous gift in proclaiming a universal feast day for Mary as the mother of the Catholic Church. He said that from now on, Catholics get to celebrate two Mother’s Days each spring — one honoring individual mothers, the other honoring the universal mother and patroness of all Christians. “First and foremost, it’s because we need to,” he said. “We need to celebrate her and her motherhood, because her motherhood is essential and important to our own salvation. It’s not an accident that the church celebrates Mary as mother of the church the day after Pentecost, he said, because this is when the Holy Spirit descended upon her, the apostles and the others who were gathered in the upper room. “How can we not remember the significance of the mystery of her Annunciation — when the angel Gabriel announced to her that she would become a mother by the overshadowing of the Holy Spirit?” said Bishop McKnight. That same Holy Spirit bestows motherhood upon the whole church, “who gives birth to new disciples by the outpouring of the Holy Spirit in the sacrament of baptism, which is renewed every time we celebrate the sacrament — the gift of the Spirit given again and again and again, always with Mary, never apart from her,” he said. An estimated 50,000 people a year visit the National Shrine of Mary, Mother of the Church and enjoy the scenic, well-manicured grounds that include the avenue of flags, a prayer path, fountains and a larger-than-life image of Mary. The shrine was dedicated in 1992 to Mary as Blessed Paul VI referred to her during the Second Vatican Council. In 2003, the U.S. Catholic bishops granted the Shrine of Mary Mother of the Church the rare designation of a national shrine. Longtime pastor Father Fred Barnett, now deceased, had the idea of developing the 6,000-seat outdoor shrine in the form of a grotto to seat more communicants than the indoor church over the summer. 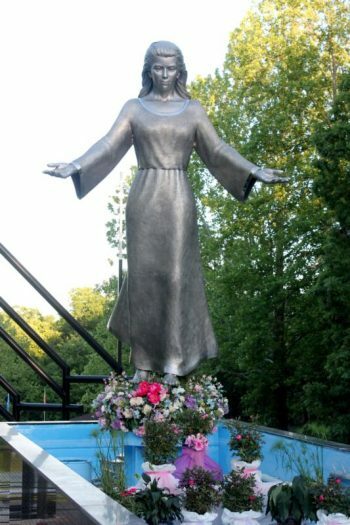 The centerpiece is a 14-foot, 2,840-pound stainless steel sculpture of Mary on a revolving pedestal above a reflection pool. PREVIOUS: Christian crowd vows to ‘reclaim Jesus’ from polarized U.S.